News just in from Axel Douque at Ocean Independence in Zurich of a further €1.2 mllion price drop on the 26.22m motor yacht Ulyssia. She was built by Ferretti’s Custom Line division in 2008 to RINA class as hull number seven in the 26m series and is fitted with an anti-roll gyro system. Built to MCA standards, Ulyssia has an interior by Giovanni Zuccon for 10 guests in a master suite, double stateroom and three twin cabins, all with large windows offering excellent sea views. One of the twins converts easily into a gym and all staterooms come with LCD television screens, entertainment systems and full en suite facilities. The main saloon has a large 42 inch LCD television. Twin MAN 1,100hp engines give her a cruising speed of 13.5 knots with a range of 1,400 nautical miles at 11 knots. 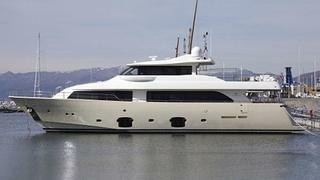 The owner is keen to move on to his next Ferretti and the price of Ulyssia is down from €3,950,000 to €2,750,000.